Michigan has a legacy of aging and failing dams, with more than 2,500 dams fragmenting our state’s waterways. These dams impact wildlife by acting as physical barriers to upstream movement, warming impounded waters and altering natural stream processes like flooding, nutrient transfer and movement of woody debris. Worse, aging dams can fail leading to catastrophic fish kills, downstream property damage and costly infrastructure repair. By working with landowners to proactively remove dams that have outlived their usefulness, we are providing a pathway to restoration of healthy river systems. Check out the Leading Small Dam Removal guidebook produced by Huron Pines. Buhl Dam sat just north of Michigan’s Alcona/Iosco county line, before the South Branch joins the Pine River. It was a high priority dam to remove as it posed a barrier to fish passage, led to warming water and created downstream erosion from the fast-moving water. In the spring of 2017, Huron Pines was successfully able to remove Buhl Dam, reconnecting over 20 miles of upstream habitat. Native brook trout and steelhead can now access upstream sections of the South Branch of the Pine River and its tributaries for the first time in decades. In addition, the dam was replaced with a new footbridge which will provide safer, easier access to the Huron-Manistee National Forest for years to come. 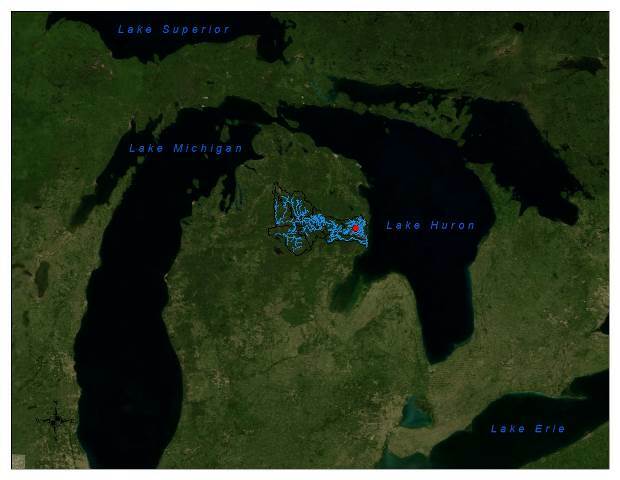 This project was made possible through joint efforts by Huron Pines, U.S. Forest Service, Pine River-Van Etten Lake Watershed Coalition (PRVEL), Michigan Department of Natural Resources, National Fish and Wildlife-Sustain Our Great Lakes and the U.S. Fish and Wildlife Service. The Pigeon River is a world-class stream with clean, icy flows that support a coldwater ecosystem and fish species like brook trout, brown trout and steelhead. 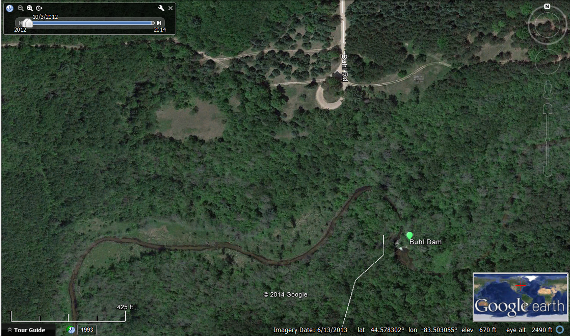 It’s a designated Blue Ribbon trout stream and a classic example of what a northern Michigan river should be. No other site divided the Pigeon River system like the Song of the Morning Dam. Dam removal had long been identified as the #1 priority for the health of the Pigeon River. Our community joined together to do the right thing for the river and users. The drawdown of the 45-acre upstream impoundment, followed by dam removal, site restoration and installation of a timber bridge are now complete. This project reconnected the Pigeon River to allow fish passage upstream for the first time in more than a century! We want to thank many dedicated funders for showing their support and making meaningful donations to this $600,000 project! After a small dam choked the natural flow of the Upper Black River in Otsego County for more than four decades, Huron Pines relieved the pressure. In 2013 we completed the removal of Saunders Dam in the Pigeon River Country State Forest to reconnect eight miles of the Upper Black River and its tributaries. The Upper Black River Council and other conservation partners had identified this project as a resource concern for many years, but removal of Saunders Dam was once seen as improbable since it was privately owned. The Michigan DNR purchased 517 acres surrounding Saunders Dam through the Natural Resource Trust Fund in 2011 and because of thoughtful collaboration between conservation partners, plans were set in place for structure removal once the public land acquisition was underway. This land is now being managed for the public good according to the Pigeon River Country Concept of Management and has walk-in access for individuals to enjoy camping, wildlife viewing, hunting and fishing in this beautiful area!